So I packed up the camera, the tripod, and the dog, and headed out to Baylands. I would have gone to the ocean, up on the bluff south of Moss Beach, but I checked the weather (fortunately), and it was foggy. We had a great time in the early morning dew. 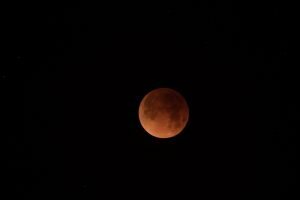 The eclipse lasted well over an hour for us. Curiously, the colors came out more vivid than I saw in the night sky. Later on, around 6:30, I took this image from my driveway just as the moon was setting over the western hills. Total occlusion was over, and the sliver of light lit up the tree branches nicely. Looks awesome, Wes! 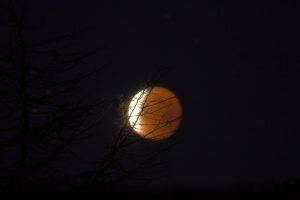 The story, a Blue Blood Moon and the page!